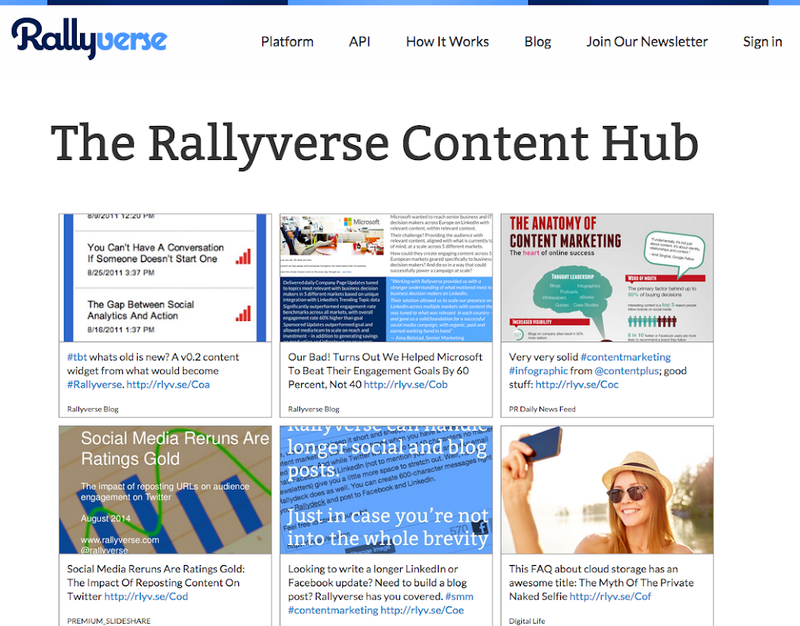 We’re very proud to announce the public beta of the Rallyverse Content Hub. Each item in the hub comes with a set of sharing controls for Twitter, Facebook, LinkedIn and Google Plus that will allow site visitors or readers to click and share the content right from the Content Hub. It’s good for you, good for your audience, and good for the publishers’ whose content you’re sharing. While we’ve offered html outputs in the past, those were static and required you to manually update them every time you made a change to your List of content items. With the Content Hub, you can automatically curate content, edit it, and have the results displayed immediately on your destination site. Think of it as a super-light CMS for scaling the content assets you already have — and building value for your team and your audience. How does the Content Hub work? Let’s dig in on some details. 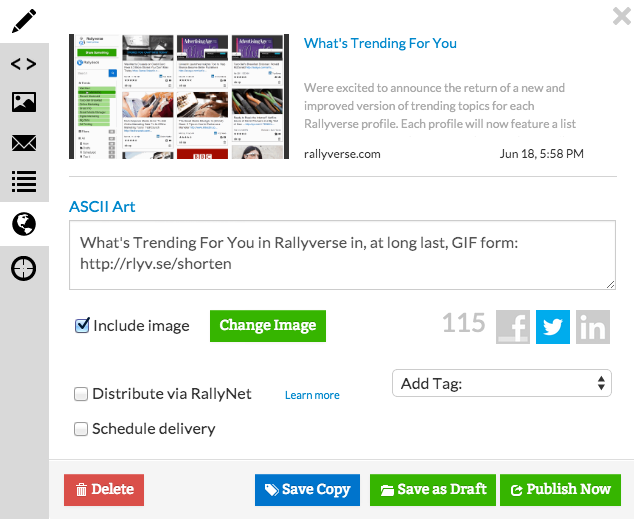 You can also choose to use automated content sources to popular your Content Hub. 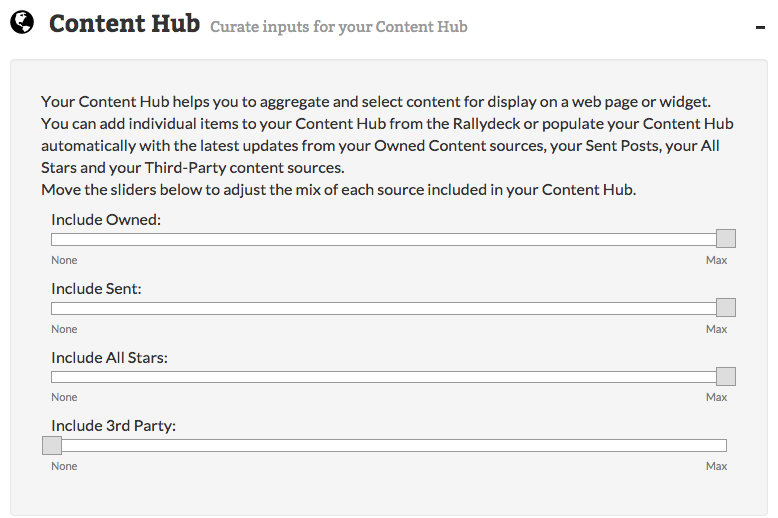 In Settings –> Content you’ll find a set of controls for your Content Hub that allow to include content from (a) Owned Sources, (b) Sent Posts, (c) All-Stars, and (d) Third-Party Sources. 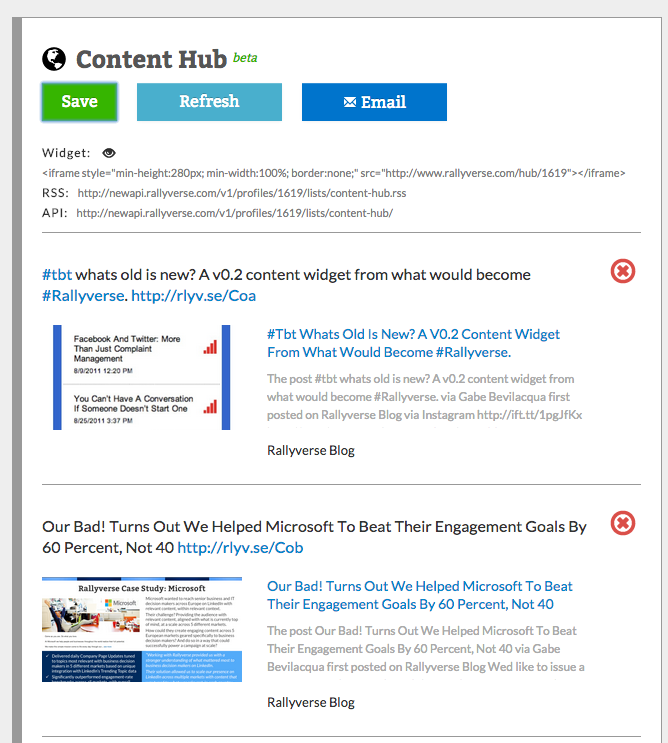 For each source, you can control the amount of content flowing into your Content Hub. You can set them at None or at various levels up to Max. Why use the automated sources at all? It gives your the flexibility to create widgets and pages that feature content that you can trust (from your Owned Sources, or maybe just your Top 5 posts from the week from your All Stars) with minimal manual work for you. You’ve already done the work to curate and create content — there’s no reason you shouldn’t be able to scale that work into web pages and widgets. To change the order of items, you click the Edit button and drag items into the order you’d prefer — your changes will be saved immediately to your publicly display Content Hub. The Content Hub offers three options for users to output the results of their Content Hub; think of them as Easy, Intermediate and Advanced. The Easy option is an IFrame that you can drop into any web page. The width of the IFrame is set automatically by the page (and the tile output is responsive so it will reformat to fit whatever page you add it to), and you can adjust the height of the output (default is a single tile height, 280px). The Intermediate option is an RSS feed that you can use to build a widget from any one of the many third-party widgets and readers on the market. RSS is easy if you’re familiar with it, but might be a hassle for some users. The Advanced option is our REST API call for the Content Hub results, which requires authentication and some coding knowledge to deploy. While the Content Hub is still in beta, we have plenty more coming ahead in the full release, including multiple output styles and options, additional automated inputs (like Twitter and Instagram hashtags), more editing tools for the individual items, and a drag-and-drop management interface in tile view.